Cholesteatoma is a condition that is very difficult to spot. It is often symptomless until it becomes more significant in size. If unchecked it can cause serious hearing and health problems. When we see the condition in our practice, it results in an immediate ENT referral. 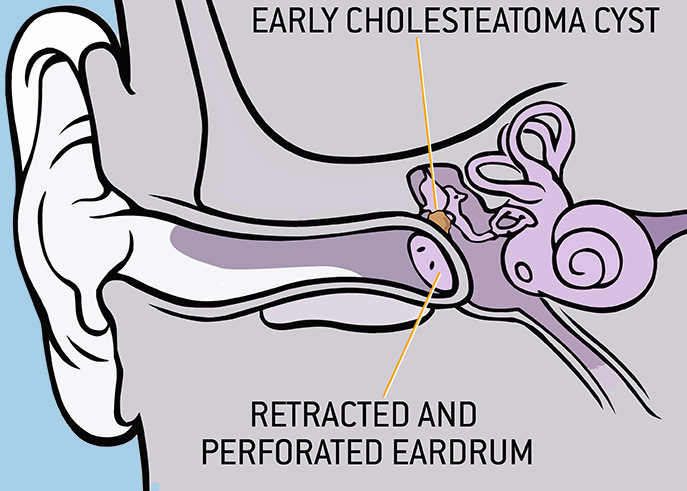 A Cholesteatoma is an abnormal collection of skin cells that gather inside your ear. 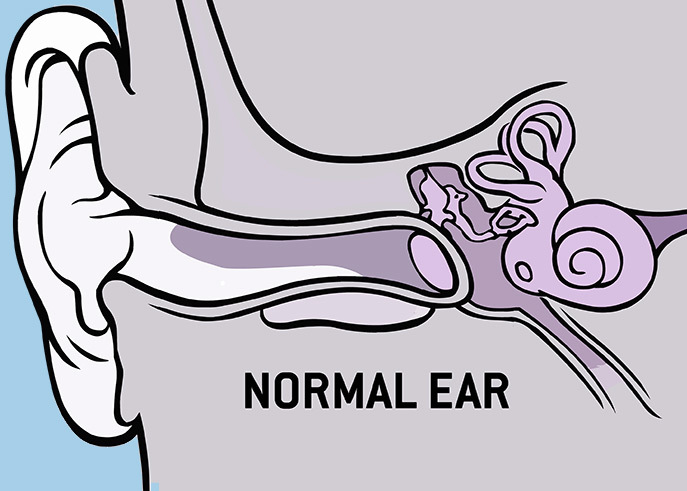 The diagram above demonstrates how difficult the condition is to detect but if left untreated, this benign growth can continue to develop and damage the delicate structures deep inside your ear. 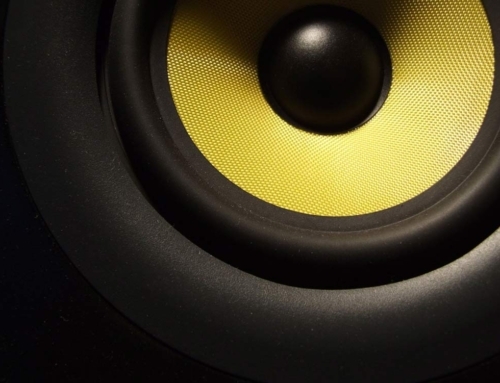 Over time it can have a devastating effect on hearing and balance. A Cholesteatoma can cause serious ear infection, which can produce discharge from the ear and in most cases hearing loss (which can be permanent), vertigo (extreme dizziness), tinnitus (ringing in the ear) and even damage to the facial nerve, causing weakness in half of your face. In very rare cases, an infection can spread into the inner ear and brain, leading to a brain abscess or meningitis. 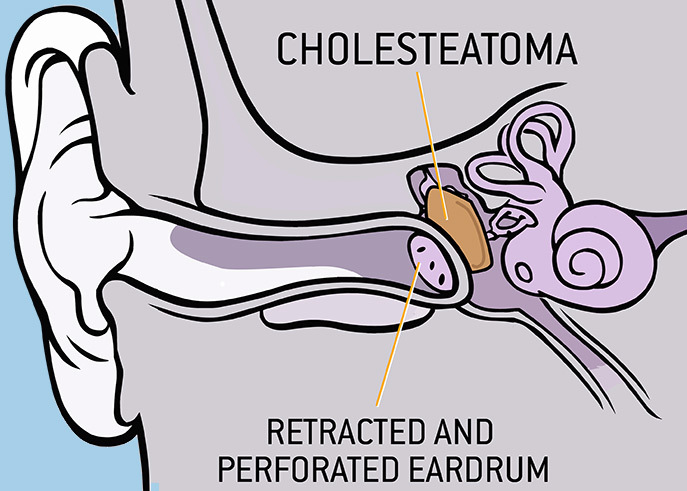 Cholesteatoma normally only affects one ear. Early warning signs are often difficult to spot but can include discharge, which is often smelly and persistent. 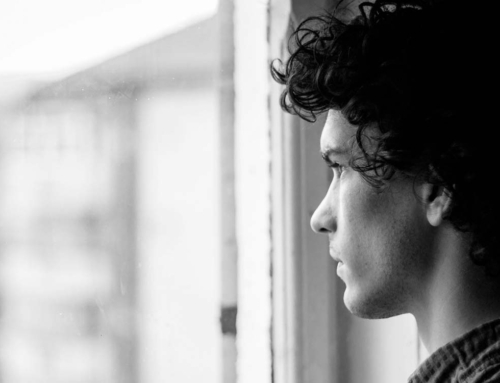 It can start to gradually affect hearing in that ear and people sometimes describe a feeling of fullness and discomfort. 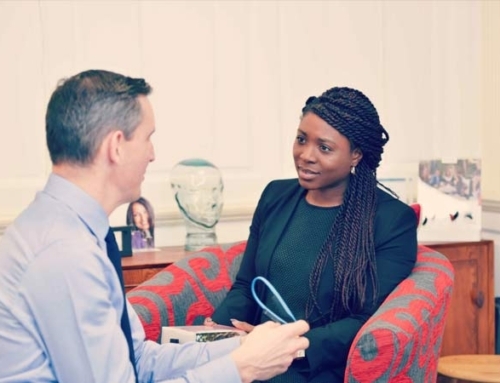 “I have had problems with my hearing for sometime after suddenly losing all the high frequency hearing in my left ear after a vascular incident. 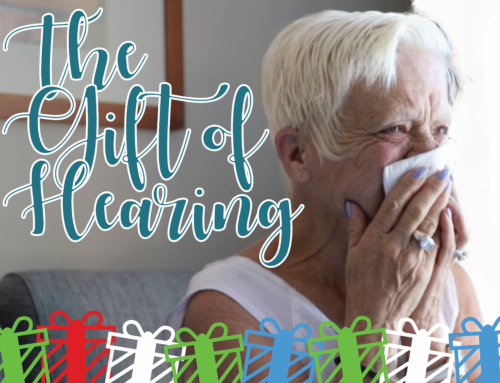 The hearing in my right ear was not brilliant, just the normal age related problem, but as it was having to do the work for both ears, I was struggling to cope with meetings at work etc. I decided to give hearing aids a try, and was advised to wear two as this would help with the speech comprehension and sound direction. It wasn’t perfect but it certainly helped and I would have been lost without them. Once I retired I became lazy (and possibly a little selfish) and only wore my hearing aids when I was attending a social occasion. This year my left ear developed a growth in the middle ear which required surgery, so it was not possible to wear a hearing aid in that ear for some months and I realised that although the hearing was very poor in that ear, wearing a hearing aid did make a difference to the quality of sound and also the direction, even if it only meant finding which room my wife was calling from. Things related to my hearing became very much worse about a month ago without the right hearing aid in I could hear almost nothing and even when the hearing aid was in, the family made me very aware that the TV was on full blast and was not comfortable to listen to and even then I was struggling to follow programmes and I realised the subtitles system is not very helpful. Trying to follow Eggheads when the subtitles are two questions behind is not much fun. We now live in Devon but decided to make a trip back to Bucks to see Duncan (my son-in-law) to see if he could do anything to improve the situation before we went on holiday. The hearing test showed a significant drop in hearing on the right ‘good side’ so it was not surprising I was struggling, the bit of good news was that the surgery on the left ear was now healed so I could once again be binaural. 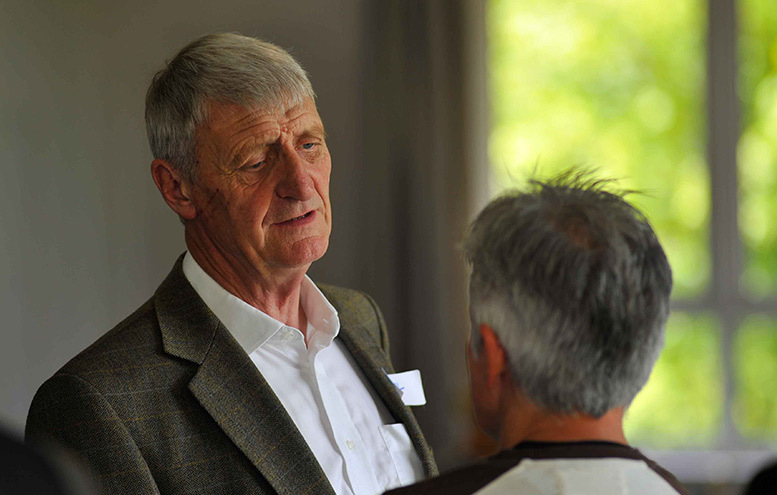 Duncan fitted me that evening with two Unitron Moxie T receiver in the canal hearing aids, to say it was a miracle is not overstating the difference. I was back in the normal, albeit noisy, world. 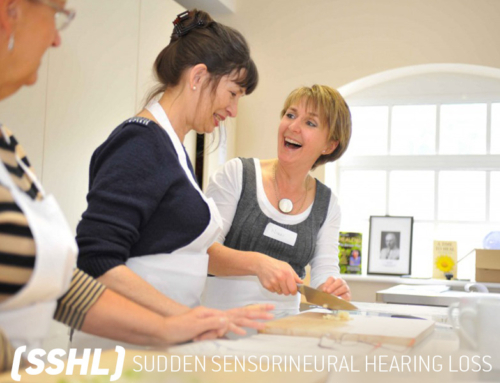 I realised how debilitating my hearing loss had been, making me feel old, isolated, nervous to join in conversations in case I had misunderstood the flow of conversation. I am normally a social person but very quickly I found I wasn’t comfortable in group conversations, even with sympathetic family members, I did not like being the person signed out for special attention, so that I could still participate. It was amazing how quickly I adjusted to the new hearing aids both physically and from the sound point of view, particularly as we went straight off on holiday to Cyprus before any fine-tuning could be done. I have loved being able to hear in noisy restaurants, chatting to new people, even when there was background music. It has also been a delight to hear again, bird song, insect noises, waves at sea and also not be phased by loud firework noise, and the army testing aircraft noise out at sea.